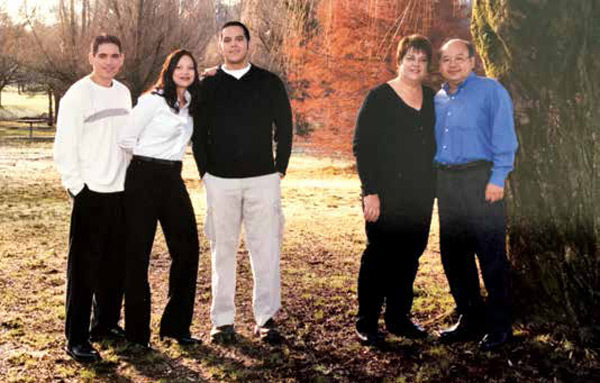 The Yeung family: George Yeung, and his wife, Cynthia, with their children, Jason, Jennifer, and Jordan (center), who works for Saudi Aramco’s Drilling and Workover organization. Dhahran — After 28 years with Saudi Aramco, Upstream Ventures Special Projects Division principal professional George Yeung has retired. Born in Hong Kong, Yeung and his wife, Cynthia, have three children — Jason, Jennifer and Jordan — and four grandchildren — Riley, Darcy, Preston, and Hunter. When he was 18, Yeung moved to Canada where he graduated with a bachelor’s of applied science degree from Queen’s University, and a master’s degree in petroleum engineering from the University of Alberta. In 1974, as a fresh graduate, Yeung started his career as a reservoir engineer in Calgary and worked as an engineering supervisor and owner of an engineering consulting company before joining Saudi Aramco in 1990. When the Yeung family arrived in Dhahran in April 1990, the children were between the ages of 10 and 14. Jennifer and Jordan attended school in Dhahran, while Jason went to boarding school the same year. All three successfully completed tertiary education in Canada. Yeung said the most rewarding aspect of his career was the 28 years he spent working on a wide variety of challenging projects with Saudi Aramco. “I worked on demanding but professionally satisfying projects such as the gas expansion program in 1994,” he said. Other project highlights for Yeung were the neutral zone concession negotiations and the Kingdom’s gas strategy in 1999, which subsequently led to the natural gas initiative and exploitation of the Kingdom’s vast endowment of unconventional gas resources. Seeing the three major projects conceived during the natural gas initiative materialize — the Rabigh Refinery and petrochemical complex and the natural gas liquids recovery plants at Hawiyah and Shaybah — was gratifying for Yeung. “These projects created significant multiplier effects to the Kingdom’s overall economy,” he said. After mentoring many young professionals during his career, Yeung’s advice to anyone in their early career is that it is “OK to make mistakes” but that it is “important to learn from your mistakes and not repeat them again. “There is no better way to learn than learning from your mistakes,” he advises. In retirement, Yeung will reside in Calgary during the warmer months and spend the remainder of the year in Hong Kong. With all of his children and grandchildren in Canada, Yeung plans to spend more time with family and to travel to places he never had time to visit, such as Alaska, the east coast of Canada and the South Pacific Islands. Yeung can be contacted on his home phone at 1-403-474-6731 or by email at [email protected].